I never knew a woman to falter or to be found for want no matter how trying a duty she had to perform in the field or at home. North and South, the women of this great nation demonstrated their heroism and devotion. Many families were faced with the loss of their primary financial supporter as men joined the military, and often became casualties or prisoners. The government was not prepared or equipped to assist dependents of the army. No form of insurance or pensions had yet been established, and the government suspended the pay of a prisoner until he was reunited with his regiment. (3) Destitute families of soldiers became primary recipients of local charities during the early years of the war and communities bonded together to support and console grieving families. At times local charities provided food and clothing for the most needy. In an era when the acceptance of charity was considered demeaning, the necessity to survive forced many women and children into the workplace. Thousands of women from different levels of society were thrust into the industrial world. Compelled by the necessity to provide for their families, these women developed an attitude of self-reliance, and public apprehension of female independence slowly eased. Many women sought livelihood as seamstresses and although the demand for this skill was consistently high during the war, there remained a surplus workforce of needy seamstresses. The overabundance of workers in this profession often abetted low wages, allowing unscrupulous government contractors to exploit their employees, and underbid independent firms. According to the 1860 census, one quarter of the manufacturing work-force was already composed of women. (9) Industries including jewelry manufacture, hat-making, paper mills, fireworks production, perfumery, and textiles largely depended on female staffs. Holding positions in what was considered light labor, women were not entitled to benefits or financial advancement. In light of the changing structure of society during the war, male-dominated industries reluctantly opened their doors to women. 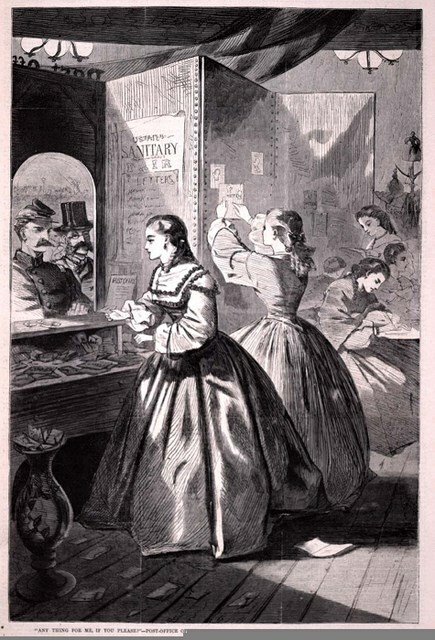 Enlistees and disgruntled striking workers were often replaced by women seeking employment. Work in munitions factories and arsenals became available to women and a number were killed in accidental explosions while wrapping cartridge packages, which were often stored dangerously in the same space. Others perished in the fires that resulted from the explosions. The unfortunate fashion of the hoop skirt intensified the danger of the fires, one skirt igniting the next. 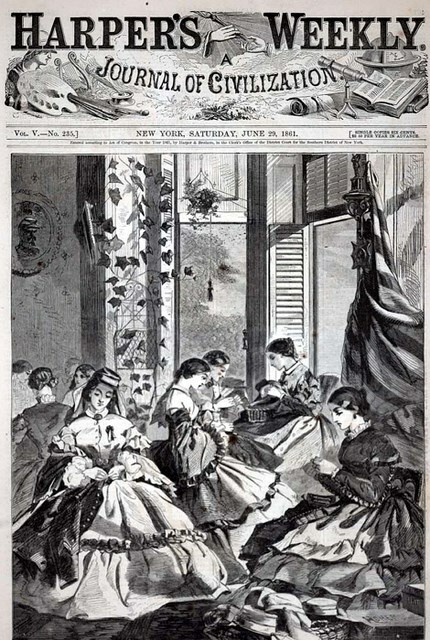 Forty women died in the explosion at the Confederate States Laboratory in Richmond while numerous others fell victim to similar mishaps in Washington, D.C., Allegheny, Pennsylvania, and Waterbury, Connecticut. Women also entered male-dominated offices. In a move initially met by controversy and opposition, Francis Spinner, the United States Treasurer, spearheaded the integration of women into the office as early as 1861. Supporting the efficiency of his female staff, Spinner was successful in securing many positions for women, ranging in responsibility from clerks to currency counters, at salaries often reaching over $700 a year. (10) Although many of these war-time appointments were established through influential sponsors, women entering these positions were sometimes unjustly accused of promiscuous activity and expelled from the work space. Prior to and during the war, the rearing of a child's moral and spiritual consciousness was a primary responsibility of the mother. The teaching of academic subjects, however, was sought outside the home, in both public and private schools. At the onset of the war, and as it progressed, increasing numbers of enlistments and higher-paying opportunities in industrial fields took many male teachers away from their respected positions and opened the door for women to join the profession. Initially, women entering the field of education were met with contradictory opinions from the public. Many Northern and Southern communities were uncomfortable with the appointment of female teachers and expressed reluctance and prejudice towards these women. Although there were many female teachers employed before the war broke out, education of the young was considered primarily the responsibility of men. Only 25 percent of the nation's teachers in 1860 were women. (12) Interestingly, a shift in public attitude occurred quickly as it became apparent that women were willing to work for less pay and comply with restrictions including curfews and celibacy. As the war progressed, the position of teacher became a widely respected vocation for 'well bred' young ladies. Return to Heroes of the Home Front.